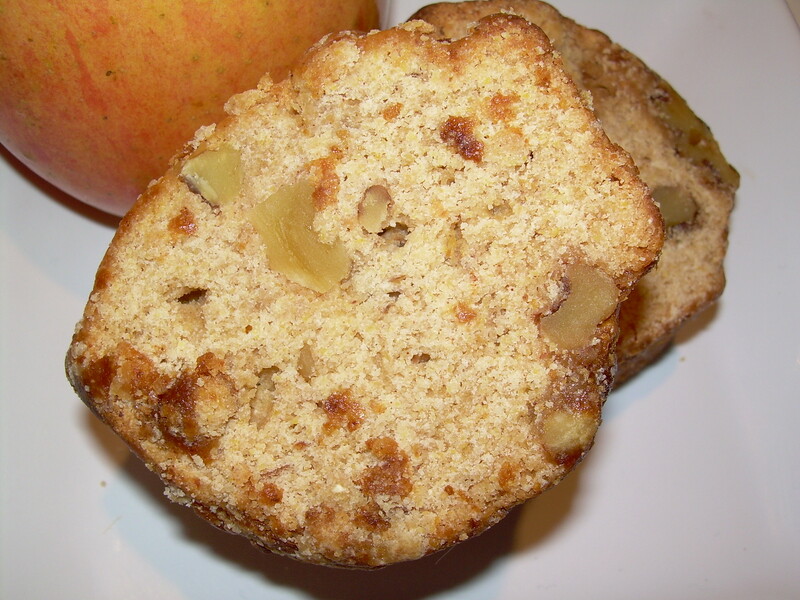 The recipe calls for cornmeal, apple butter, and whole wheat flour, all of which I had on hand and really needed to use. I tweaked the recipe a bit, and substituted white whole wheat flour, some homemade candied walnuts, and I eliminated the glaze. The result? Master Chow loved this cake and asked me to put it on the repeat list. I thought it was a tad too sweet, but I usually think that about desserts and everyone always disagrees with me, so take my opinion with a grain of salt. 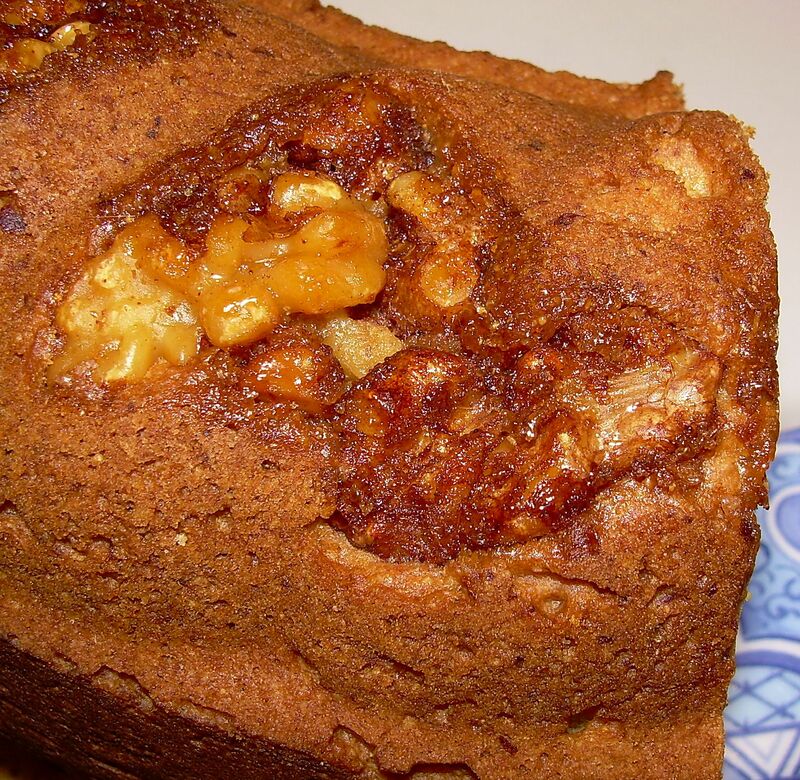 The candied walnuts were fantastic – they created almost a toffee-caramely-type crust on the top of the cake. That was my favorite part! A cooking note: store your cornmeal in the freezer – it goes rancid very quickly. Before you use it, give it a sniff test. It should smell like corn, not musty or rancid. If it does smell “off,” do NOT use it, or your entire cake could end up tasting pretty bad! Center a baking rack in the middle of the oven. Preheat oven to 350 degrees F. Grease and flour the pan of your choice, or use a baking cooking spray (that’s what I used). Sprinkle 3/4 cup chopped nuts in the bottom of the pan, and set aside. Whisk together the cornmeal, flours, baking powder, cinnamon, and salt in a medium bowl. Beat together the butter and cream cheese in a large mixer until no lumps remain. Add the sugar gradually, beating until the mixture is light and fluffy. Add the eggs, one at a time, scraping the sides and bottom of the bowl after each addition. Add the dry ingredients, alternating with the apple butter, beginning and ending with the flour mixture. Stir in the bourbon and nuts. Pour the batter into the prepared pan. Place the pan (especially if it has a dark interior) on a baking sheet, and place in the oven. Bake until a cake tester inserted in the center comes out clean, about 1 hour to 1 hour and 10 minutes. I had a little over a cup of apple butter, so mine took about 75 minutes to bake. 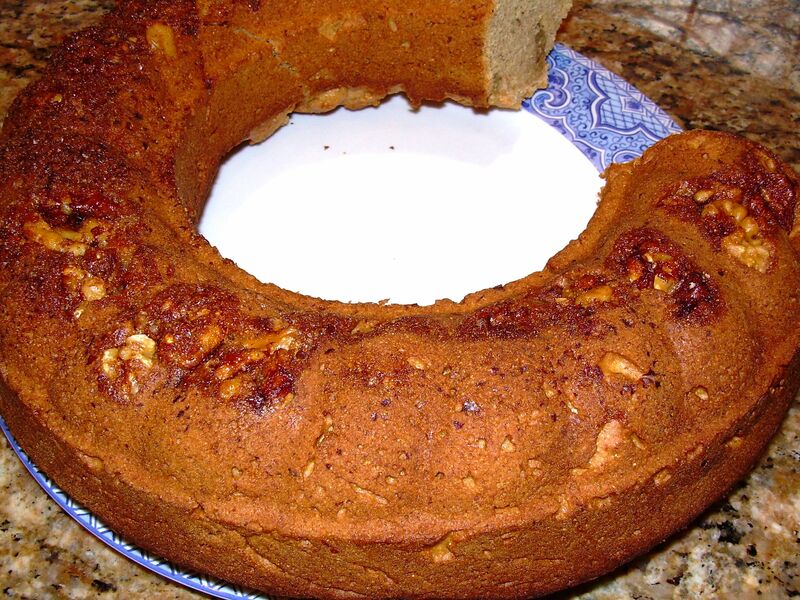 remove from the oven and place the cake, in the pan, on a rack; cook for 10 minutes. After 10 minutes, invert the cake out of tis pan onto a cooling rack, and cook completely before glazing. If desired, dust with powdered sugar before serving. Your inherited tin is gorgeous! 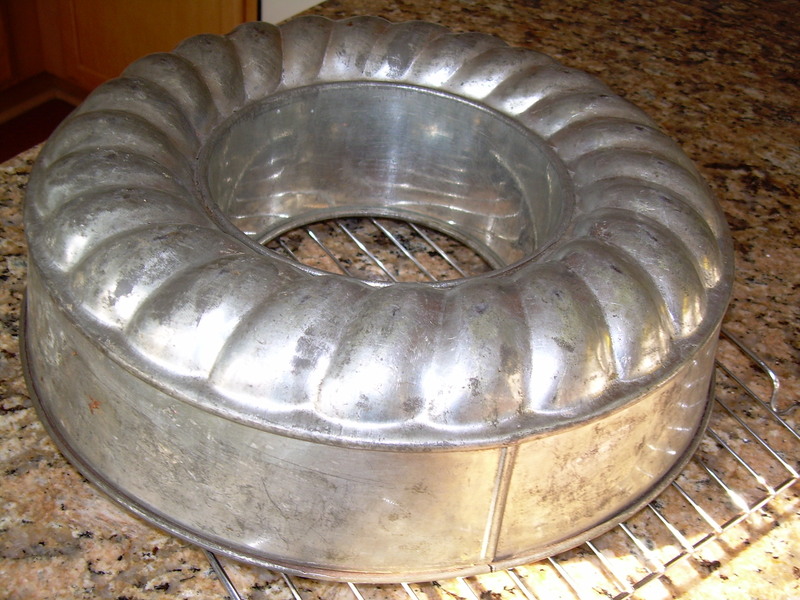 I have a fetish for antique cake tins! The cake sounds absolutely delicious, and how wonderful to be able to receive such great bake ware!